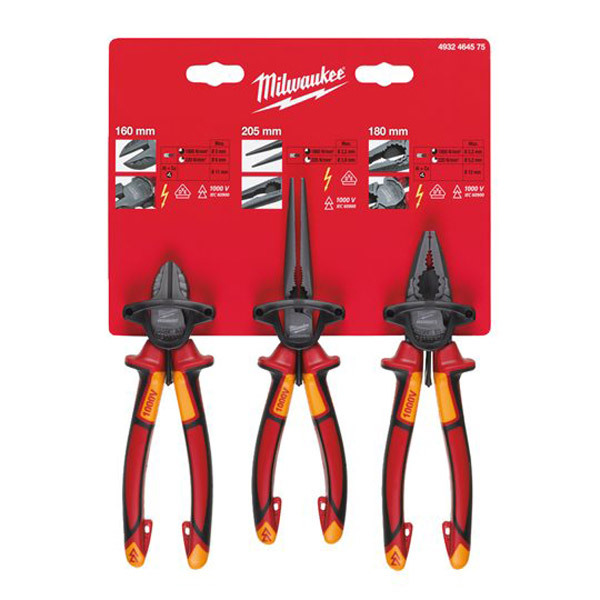 Milwaukee's 3 piece VDE plier set comes with three VDE (DIN EN/IEC 60900) certified tools, all of which are tested to 10,000V and guaranteed to 1,000V. The induction hardened cutting edges allow the tools to be used on a variety of materials, while forged steel blades are both strong and long lasting. The pliers also boast an ergonomic grip which is designed to create a tool which can be used for hours without the user tiring. Precision machined joints create maximum power transmission for simple yet effortless operation.